In modern parlance, the Western world refers to a person who has a physical or mental limitation as disabled. In less politically correct times when secretaries were called secretaries, disabled people were called handicapped. In China, this is taken one step further. Bathroom stalls reserved for disabled persons have the words "Deformity Man" prominently emblazoned on them. These are of particular use to me as they are often the only Western style toilet option available amidst a sea of fetid trenches, holes, or other open pits in which to deposit waste. I enjoy squatting during emergencies, but when I have enough time I prefer to take a seat. 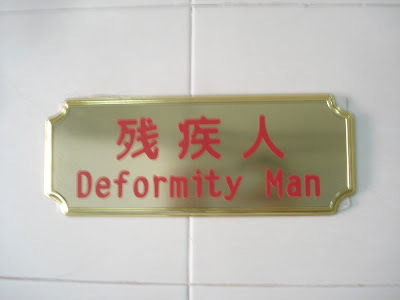 Many Chinese men are uncomfortable with their buttocks making contact with the potentially hazardous seating surface of a Western toilet, so their allegiance lies squarely with the squat toilet. In a five star Shangri La hotel in Inner Mongolia, footprints were clearly visible on the toilet seat. On another occasion, there were several men waiting around all but one stall in a public bathroom. I went to investigate why this singular outlet was being ignored. I opened the door to find out it was a Western toilet. To my surprise everybody was content to wait for one of the squat toilets to become free, even though an alternative was available to them. "As easy as lifting one's finger. Be civilized." ~ A message displayed on top of a urinal recommending the user to flush it after use.